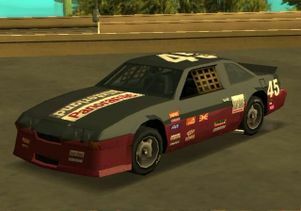 The Hotring Racer is fast unlockable race car featured in Grand Theft Auto: Vice City and Grand Theft Auto: San Andreas. The Hotring Racer is a fairly fast vehicle, and is used in the Stadium challenges in both GTA Vice City and GTA San Andreas, ("Hotring" and "8-Track", respectively). It can be obtained in GTA Vice City by completing the Sunshine Autos import missions; and in GTA San Andreas, it is unlocked by beating "8-Track". In GTA San Andreas, its top speed reaches 148 mph (238 km/h), making this car one of the second fastest vehicles of the game. Each variant of the Hotring Racer features well known businesses as sponsors that appear in Vice City, Liberty City and San Andreas. Under normal circumstances, the "hotring" is the only version of the Hotring Racer available for the player to drive freely in the game world, while the "hotrina" and "hotrinb" are only available via cheats or mods, such as the use of a garage editor or trainers. One exception is present in GTA San Andreas, when the player must drive a "hotrinb" in 8-Track races. In GTA Vice City, the hotrina may spawn with the numbers #21, #34, #56, or #78, while the hotrinb may be marked with the numbers #14, #28, #65, or #69. In GTA San Andreas, the hotrina can be numbered #14, #52, #73, or 96, while the hotrinb may obtain the numbers #07, #36, #65, or #86. The "hotrinb" Hotring Racer, not normally available for the player to drive outside of the 8-Track event (Rear quarter view). In Grand Theft Auto IV, the GTA San Andreas Hotring Racer makes a cameo appearance in a racing commercial on television for the "Patriot 500" actually taking place in GTA San Andreas at Los Santos International Airport, where Carl Johnson drives the Hotring Racer (with different colors) on the airport runway. Unlike real-life stock cars, all variants of the Hotring Racer have headlights, taillights and a horn. In GTA Vice City, if the player is driving a Hotring Racer while under any wanted level, the police radio will describe the player as driving a "sports car". If the player drives the "hotrina" or "hotrinb" variants, the police radio will refuse to classify the type of vehicle the player is driving. This page was last modified on 19 April 2015, at 19:39.